Come by and see the BAYSIDE perform live in the dinning room. Dine, Dance and enjoy the sounds of jazz and big band swing! Originally formed in 1982, the Bayside Big Band now consists of 17 professional and semi-professional musicians and vocalists. The band performs regularly throughout the Washington-Baltimore area. Bayside Big Band is ready to provide the big band sound to fit any occasion. We play public and private dances, weddings, corporate events, private parties, night clubs, civic concerts and benefits, as well as, regional and national conventions. For the last seven years, Bayside has performed every week in and around the Baltimore/Annapolis/Washington area. 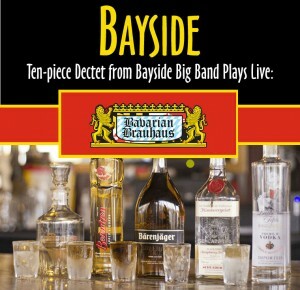 Bayside Big Band strives to maintain the big band sound by playing the music of famous big bands from the 1930’s to the present day, the early traditional swing sounds of Count Basie, Glenn Miller and Benny Goodman, the modern sounds of the Tonight Show Orchestra, the neo-swing sounds of the Brian Setzer Orchestra. To achieve this goal, Bayside has established a library of over 1000 arrangements, the majority being the original as recorded versions.